In 2010, I predicted that Auburn would go 11-0 in the regular season with a toss-up against Alabama. Auburn went 12-0 in the regular season. In 2011, I predicted that Auburn would go 9-2 in the regular season with a toss-up against Alabama. Auburn went 7-5 in the regular season. In 2012, I vowed to never pick another Auburn loss because of the results of 2010. I did just that and Auburn won 3 games. Enough with that logic. Aug. 31 – Washington State – Mike Leach will call five running plays, and the injured Auburn secondary will struggle early, but the Malzahn offense will torch the Wazzus. Worry level: 3. Score: Auburn 42, Washington State 17. Sept. 7 – Arkansas State – Storylines don’t matter with a talent difference this large, but there will be many points scored. Worry level: 4. 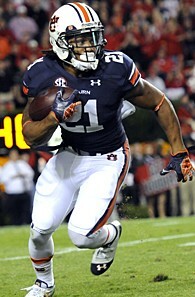 Score: Auburn 38, Arkansas State 20. Sept. 14 – Mississippi State – Dan Mullen will wish Auburn still had Cam when he sees what Marshall plus Gus does to his Maroons. Worry level: 5. Score: Auburn 31, Mississippi State 17. Sept. 21 – at LSU – Even though it’s in Baton Rouge, LSU won’t be better than last year, but Auburn will, giving Gus his first major win as Auburn’s head coach. Worry level: 8. Score: Auburn 21, LSU 17. Oct. 5 – Ole Miss – Gus will show Freeze what this offense can do with real talent, as the Rebels dark horse season begins to unravel. Worry level: 6. Score: Auburn 35, Ole Miss 28. Oct. 12 – Western Carolina – Jonathan Wallace will play the entire second half, and it won’t be because Nick Marshall is injured. Worry level: 1. Score: Auburn 49, Western Carolina 7. Oct. 19 – at Texas A&M – Assuming Manziel plays, he and the new atmosphere will be too much for the Tigers, as they take their first loss of the season. Worry level: 9. Score: Texas A&M 34, Auburn 24. Oct. 26- Florida Atlantic – The Owls will provide a nice break between two lengthy road trips, with Marshall being responsible for six total touchdowns. Worry level: 2. Score: Auburn 48, Florida Atlantic 10. Nov. 2 – at Arkansas – Gus returns to his homeland and runs 100 plays in an attempt to injure all of the Arkansas defenders right in front of Bret Bielema. Worry level: 5. Score: Auburn 41, Arkansas 13. Nov. 9 – at Tennessee – Neyland Stadium is intimidating, but the Vols have been down too long to have it really rocking, as Tre Mason runs for 250 in the win. Worry level: 6. Score: Auburn 31, Tennessee 23. Nov. 16 – Georgia – Georgia may finally have what it takes to win a national championship, but this one won’t be as ugly as the past few, with Nick Marshall showing that he could hang with Aaron Murray at Georgia. Worry level: 10. Score: Georgia 30, Auburn 21. Nov. 30 – Alabama – I’m feeling 2009 all over again with this one, but maybe with a better outcome this time. That wasn’t so homer, was it? Ok, 9-2 plus the Iron Bowl tossup might be, but we didn’t expect 8 wins in 2009 and the talent then was nowhere near what we have now. When you look at it, the road games aren’t near as bad as they could be. LSU will be down. Texas A&M will be Manziel-less or at least living in the shadow of the Manziel drama. Arkansas and Tennessee are both down. And both Georgia and Alabama come to the Plains. It’s slightly favorable, assuming Auburn will have a pulse this year. And they will. And they will win. Now, tell me how dumb I am, and that you see ’bout seven wins. As much as I hope you’re right, I’m afraid LSU won’t be as down as people think. LSU and bama are toss ups. And I think we lose either Arkansas or Tenn. but not both; 9-3 at best; 7-5 at worst. This is always my favorite post of the pre-season. You think we will loose to UGAly, but your worry level is zero? It was supposed to be 10. Fixed. Surprisingly, neither you or Blake seemed overly pumped about Nick getting the nod at QB. I understand cautious optimism, but from multiple accounts he could be a professional in Baseball or Basketball if he didn’t stick with pigskin. Great athlete. Judging by Todd’s accomplishments with much less talent, I see Marshall having a great year and breaking some records. That being said, 9 wins seems very possible. War Damn. God love you, Blogle. OK, what the hay – I’m with you. 9-2 and an Iron Bowl toss up. From your lips to Gods ears my friend. I’m glad we are on the same page. I think 10-2 is within our grasp, 9-3 definitely is. Of course I’m just a dumb barner who predicted a National Championship in 2010, what do I know. I love it. I’ve worn orange and blue goggles since 1967. P.S. NCAA rule 12.5.2.1 needs to be enforced immediately ! !